Pilot Barry Seal is recruited by the CIA to run covert reconnaissance and transport missions while simultaneously working as a mule for the Colombian drug cartel. Spy photos, gun running, Contra transport, drug trafficking, and nation building...all in a day's work for Barry Seal. "American Made" is the somewhat true but not really true story of pilot Barry Seal, though director Doug Liman and writer Gary Spinelli both openly admit they never intended to make this movie a biopic. This is about sensationalizing a man who had an interesting life. This is about creating a compelling narrative around key moments that took place throughout his career while working for these different organizations. 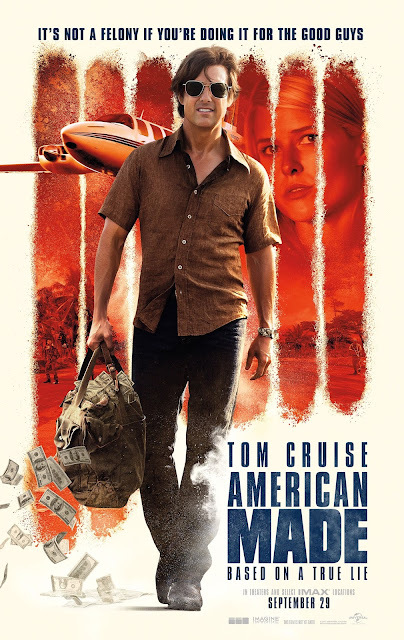 The way Doug Liman tells it, Barry Seal, played by Tom Cruise, was a TWA pilot who dabbled in smuggling black market items into the US such as cigars from Cuba. He was approached by CIA agent Monty Schaffer, played by Domhnall Gleeson, who makes a proposal for Seal to do reconnaissance work for them taking spy photos of communist insurgents in Latin America. From there, Seal was approached by the Medellín Cartel, where he was paid an obscene amount of money to smuggle an obscene amount cocaine into the United States. The CIA was aware of this, but they looked the other way so Barry would run guns to the Contras in Nicaragua, who were fighting the newly-installed communist government. He was also tasked with flying the Contras back to the US for training. Despite all of these moving parts, it really seems like nobody had a damn clue what they are doing. "American Made" is a film where Tom Cruise gets to be at his best, unlike "The Mummy" remake from earlier this year, which showcased Cruise at his worst. This film reminds us why Cruise is still a superstar and shows that he can make any character, even a drug smuggling criminal, extremely charming and likable. If Cruise can make himself, a couch-jumping Scientology advocate, charming and likable, then it's not a stretch now, is it? The supporting cast is great as well, especially Domhnall Gleeson, who offers a very engaging performance as Schaffer. We get the sense that he's not telling Seal the whole story, and with good reason. Gleeson has an extremely convincing American accent. Sarah Wright is also the perfect fit to play Lucy, the loving but not too trusting wife of Barry Seal. She's skeptical, a little strong, and a little vulnerable. We remained engaged by this outlandish story and all the things that happen throughout the telling of it. The movie has both comedy and tense, exciting moments of action. Even though we know the details aren't all entirely true, we know some of the overall events are factual. It is really interesting to go back and revisit the history of the Iran-Contra scandal and the other politics surrounding it to see just how screwed up it all got several decades ago. "American Made" is a lot of wild fun. It isn't trying to deliver a message or make the audience think too terribly hard. It's just trying to make sure you have a good time watching it, and in that aspect, it succeeds. Our complaints are few. It's a little long and a little disjointed, but it's still an interesting watch.